The heiress to the Bellerose estate has gone missing and what a waste of a dowry it is! Charlotte Bellamy’s future husband, Lord Geoffrey Seavers, is in desperate need to finance his royal fleet, yet somehow Charlotte disappeared and the Bellamy inheritance slipped through his fingers. Enter Alicia, a tavern maid of uncertain parentage. Yes, she’s a bit young and headstrong, but no one at court has actually ever seen the Lady Bellamy, and Alicia’s beauty, poise, and bearing are enough to fool the king. At least, that’s what Geoffrey hopes when he proposes the Bellerose bargain: Alicia must pose as Charlotte, marry Geoffrey, split the dowry, fake her death, then both can part ways wealthier than they ever dreamed. Everything goes according to plan at first. Alicia charms King Charles II and his court easily, but did Geoffrey, her “business partner,” have to be so dashing, tempestuous and oh-so-irresistible? Falling in love wasn’t supposed to be part of the bargain…Worst of all, someone at court knows the true Charlotte Bellamy and recognizes Alicia for who she is. The truth of her past and the lies of her present are about to collide, and suddenly, Alicia and Geoffrey have more than they bargained for. Set in Restoration England, THE BELLEROSE BARGAIN is full of passion, conspiracies, and intrigue. Fans of VIRGIN RIVER are sure to love this historical novel written with Robyn’s trademark zest for life. 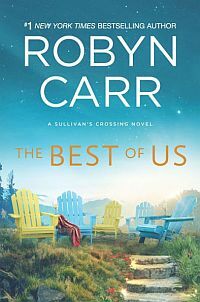 Robyn Carr is the New York Times and USA Today bestselling author of The Virgin River Series, published by MIRA. THE BELLEROSE BARGAIN is the second of her nine historical novels, which have been reissued as digital editions.